The CAP Channel Trading is a volatility-based indicator that makes use of the “advanced envelope theory”. These envelopes consist of two outer lines. Envelope theory states that the market price will generally fall between the boundaries of the envelope (or channel). If prices move outside the envelope, it is a trading signal or trading opportunity. Basically CAP Channel Trading can be used to help identify overbought and oversold conditions in a market. When a market’s price is close to the upper band, the market is considered overbought (buying area). Conversely, when a market’s price is close to the bottom band, the market is considered oversold (selling area). Indicator give you arrow signal when price try to reversal. It is recommended to open positions when the price comes 30 points or closer to the channel border. However, this study can be used to help determine the strength of a price trend. Some traders use a market price move and price close that is above the upper band of the CAP Channel Trading as a buy signal, and use a push below and price close below the lower band as a sell signal. An advantage of CAP Channel Trading indicator compared to other channel indicators is that market lag is not as pronounced because CAP Channel Trading are extremely sensitive to fluctuations in volatility. By varying the bands on the most recent average daily price range, the channels will naturally be a greater distance from the market when the price swings are wide than when they are narrow. However, they will stay at a much more constant width than other envelope methods. To understand the concepts behind this Indicator and learn to use it, kindly read this blog post. Interpolate - Interpolate Mode identifies minimize channel levels. We recommend using it if you are an intraday trader. Minimum Bar Redraw - Minimum to re-calculate to draw the channel. Show Analysis Report - Show analysis repost on chart. 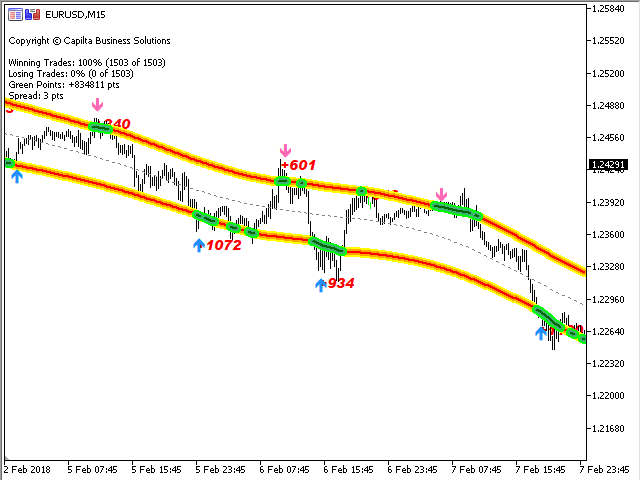 DisplayProfits - Display profit of every signal on chart. Signal Bar- work on the current bar / work on closed bars. 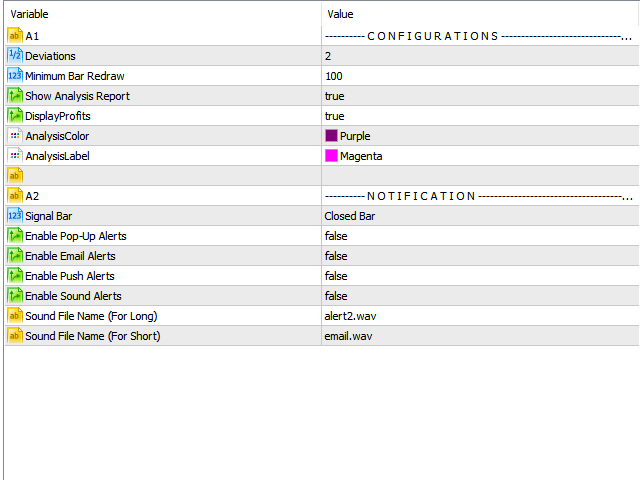 Enable Pop-Up Alerts: You will get an alert message in your MetaTrader 4 platform. Enable Email Alerts: You will get an e-mail if you set up the correct e-mail settings for your e-mail provider at your MetaTrader 4 platform. Enable Push Alerts: You will get a notification on your mobile device if you set up the mobile notification settings of your MetaTrader 4 platform. Enable Sound Alerts: You will get an audio notification in your MetaTrader 4 platform. Sound File Name (For Long): Enter the name of a sound file to hear an individual audio notification. The selected sound file must be installed in the “Sounds” directory of your MetaTrader 4 platform. Sound File Name (For Short): Enter the name of a sound file to hear an individual audio notification. The selected sound file must be installed in the “Sounds” directory of your MetaTrader 4 platform. Very stable. Good for using as a filter in a tradesystem. Great Indicator! Thank you, good job! Great indicator, it gives good boundary. Перерисовывается. В итоге картинка получается красивая, стрелочки стоят где надо, а на деле - фигня полная. Индюк перерисовываться не должен! Это вводит в заблуждение. indicator shows a lot of promise for profitable strategies! One of the best indicators! Help me with code for "iCustom" please. I would like connect "CAP Channel Trading Indicator for MT5" to my expert. Great market Channel! Just take a time to understand how market works with the Redraw System, but it's normal for any indicator. I recommend. -->Logic are same. Nothing change. -->Add Refresh button. So click on button when you show mismatch data.